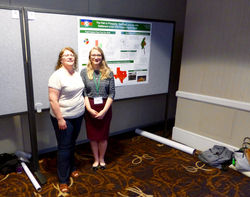 Kaitlin Stewart, Stephen F. Austin State University history and geography freshman, was the youngest presenter at the 2018 American Association of Geographers annual conference in New Orleans. Stewart's presentation on the Chin, an immigrant group located in North Texas, won honorable mention from the group Supporting Women in Geography. NACOGDOCHES, Texas - Not only was Kaitlin Stewart, Stephen F. Austin State University history and geography freshman, the youngest presenter at the 2018 American Association of Geographers annual conference, but she also earned one of only two awards presented by the Supporting Women in Geography organization. "I felt a little intimidated and under qualified. However, I was received warmly, and many people were impressed with how young I was," Stewart said. SFA's Department of Anthropology, Geography and Sociology sponsored Stewart at the conference, held in New Orleans. Stewart presented research about the Chin, a group of immigrants living in North Texas. She presented alongside graduate students and advanced undergraduates from around the nation. Stewart's presentation received an honorable mention from Supporting Women in Geography, a group of accomplished geography professionals. "I submitted my paper with no expectations. When I talked to women at the conference - women who have been studying geography for years - and they told me my paper had promise and potential, it blew me away," Stewart said. "This experience has encouraged me to keep working hard in my studies." Originally a history major, Stewart decided to double major in history and geography after completing a course with Dr. Jeffery Roth, SFA associate professor of geography. Roth encouraged Stewart to pursue geography and to conduct research. "The entire geography department has been my biggest support moving through my research process," Stewart said. "My professors are encouraging, and I feel like I can always go to them if I need help." For more information on SFA's Department of Anthropology, Geography and Sociology, visit sfasu.edu/anthrogeosoc/ or call (936) 468-4405.